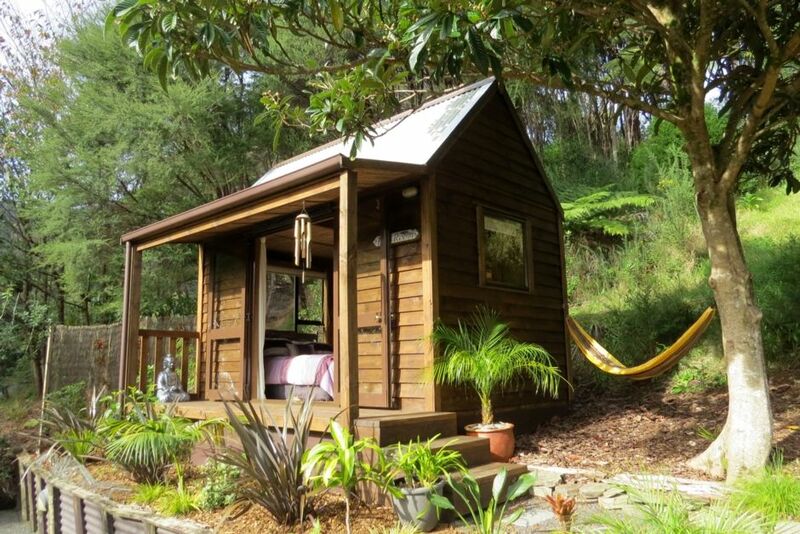 "The Bali Room" is a new Cabin Style Accommodation that offers you a peaceful, serene environment. Situated on nearly ¾ of an acre, and just over 3 kilometres from town, your spacious outdoor Balinese style Bathroom and Kitchen, complete with outdoor Chimenea, will have you enjoying the garden and bush surroundings. These facilities are shared if our "Bali Haven," sleeping maximum 2 guests is occupied. Your Bali Room overlooks trees, bush and organic gardens. The owner of the premises lives in a separate Studio Apartment on the property, but is completely unobtrusive. She is on hand should you need any type of assistance. We are an Eco Friendly property and recycling is encouraged. Only 100% natural cleaning products are used. toilet, shower, Undercover outdoor facilities - Bali Style. I was looking for a peaceful getaway, just me and my dog while leaving the husband and kids at home. Boy did I choose the perfect location!!! This little cabin was absolute bliss and the hammock was the perfect place to take a nap and read a book. The kitchen and bathroom area were so beautiful and immaculate. I have decided to make this little piece of Bali paradise in the Coromandel my yearly getaway spot. Thank you for sharing your amazing place with me. The atmosphere is peaceful and restorative. The planted gardens give a feel of a Balinese retreat and Dianna the host is lovely. This is a little oasis, we had four nights in the Bali Hut and were totally relaxed from day one! Di is a gem, the place is immaculately clean yet really welcoming. We were lucky to have the facilities to ourselves the whole time, which made it even more of an escape from the world! We also really appreciated the genuine dog-friendly nature of the place, and the owner! Would absolutely recommend, and hope to return. It was lovely meeting your and your lovely dog Stella and so glad you enjoyed our stay. Thank you for leaving the place so clean and tidy. Hope to see you back again one day. Serene and truly beautiful location. Great love and respect for nature is reflected in the way this fantastic place looks and feels. Dianne's hosting is superb - thank you so much for your kind hospitality. Outside shower is truly magnificent! Thank you for leaving the place so clean and tidy Karolina. We hope to see you back one day. Great place to stay nice and private. Great place to stay nice and private. Well looked after. What an amazing place to stay. What an amazing place to stay. The property and facilities are an absolute credit to Dianna who owns it. The grounds are full of native plants which makes the Bali accommodation so realistic and ever so relaxing not to mention the Bali architecture and ornaments that set the theme. The bird life is just spectacular and the bush setting echoes with birds singing. The both of us felt so welcomed and very relaxed. We would highly recommend this accommodation to others.